Beetroot combines fabulously with most cheeses – I’ve tried it in various dishes with feta, mozzarella, cheddar, blue cheese and goat’s cheese – and one of my favourites would be goat’s cheese. There’s something about the sweet, earthy bite of the beetroot combined with the sharp, creamy, very different earthiness of the cheese that is just wonderful together. 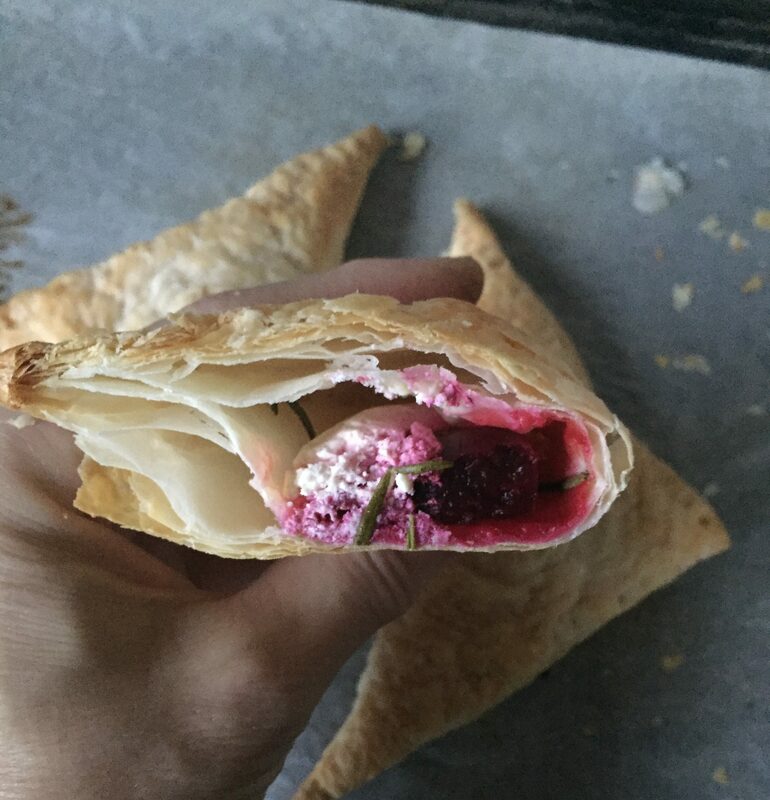 In this case I’ve added the piney kick of rosemary, and wrapped it all up in little pastry parcels that give a lovely crisp contrast to the creamy cheese and tender beetroot. These are lovely warm or room temperature, and make wonderful appetisers, party, or picnic food. If you want really mini ones you can cut the pastry sheets into eight triangles rather than quarters and make them half sized. Now, there are a few ways you can make these with varying levels of ‘cooking investment’, varying from incredibly quick to pretty time consuming. If you buy cooked beetroot and frozen puff pastry, then it will probably take 30 min from beginning to end. If you cook the beetroot yourself it will take longer, but I often cook the beetroot when I’m using the oven for something else, (put in a dish with a bit of water and a couple of rosemary sprigs and cook for about 45 min). 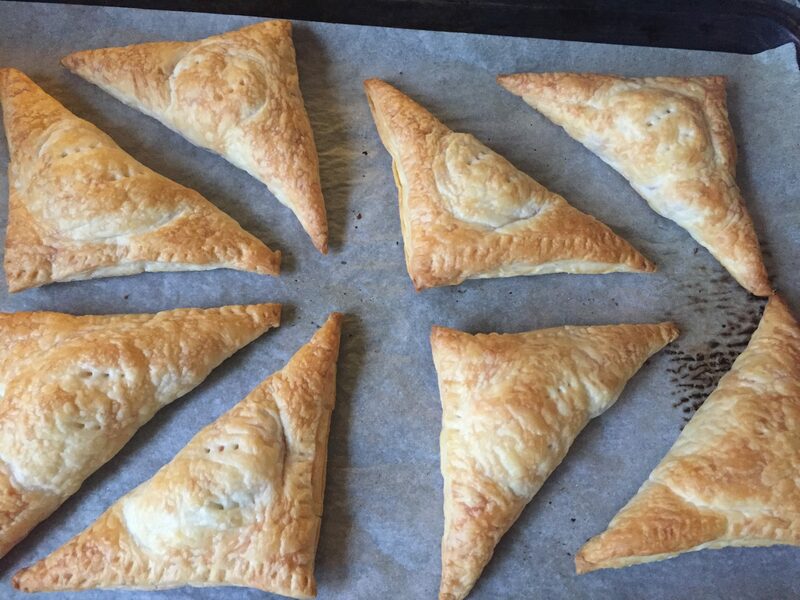 If you’re really keen you can make flaky pastry as well, but I don’t do that often! Preheat oven to 200C. If the pastry is frozen, the remove from the freezer, and separate sheets to thaw. Slice beetroot thickly, slice cheese, and remove leaves from rosemary and chop finely. Cut each sheet of pastry in quarters, and top each quarter with a couple of slices of beetroot, add cheese and a sprinkling of rosemary, and season with salt and freshly ground pepper. Fold the pastry over the filling and seal the edges with a fork. Prick the top of each pastry a couple of times. Bake for 15-20 minutes until golden brown. Cool slightly on a rack before eating. Makes 12. Lovely Beck, on the making list. These look delicious Beck 😋 YUM!